Valve's first expansion to post apocalyptic zombie shooter Left 4 Dead 2 makes one appreciate the developer's gift with wordplay and just how important being able to see through walls is when battling the infected. The Passing brings new things to Left 4 Dead 2, including a new three-level campaign set in a wet Georgia town, one new firearm (the incredibly satisfying M60 machine gun), one melee weapon (a golf club), a new "uncommon common" zombie known as the Fallen Survivor, and the new concept of Mutations. The last item in that list offers weekly variations on Left 4 Dead 2's various game modes. The initial Mutation is "Realism Versus," which makes life as a Survivor much more difficult when playing against human-controlled Special Infected opponents online. 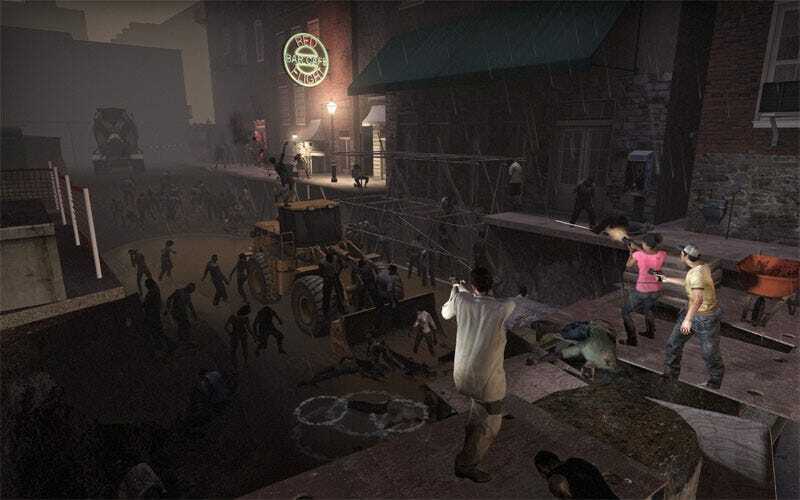 The downloadable add-on, released on the Xbox 360 and PC, also offers a passing encounter with the Survivors of the original Left 4 Dead, tying the two games more closely together. The Fallen Survivor: It may be a small and rarely encountered addition to the ranks of the infected zombie masses, but The Passing's Fallen Survivor introduces an unexpected twist. Because the Fallen Survivor often drops coveted supplies like pain pills, health kits and Molotov cocktails, he's an attractive target. But he's also a target on the run. Unlike Left 4 Dead 2's other zombie types which crowd the player and warrant cautious progress, the Fallen Survivor forces the player to make chase, abandoning caution and ammo conservation, changing the tactics players must use. Mutations: It may be too early to say just how successful Mutations are in the long term appeal of The Passing, since "Realism Versus" is just one of more than 20 planned variations on established game types. But "Realism Versus" is a thrill in itself and the promise of unlimited use chainsaws in the game's Campaign mode, among other mystery rule changes, assures that I'll be checking in weekly to make sure my copy of Left 4 Dead 2 gets properly mutated. Uncommonly Common: While the new campaign brings with it fresh maps on which to play the gas-guzzling Scavenge mode and multiplayer Versus matches, the campaign itself feels a bit flat. The Passing is lacking in much of the unique appeal that made Left 4 Dead 2's other chapters so exciting. The three-level campaign borrows some of the highlights from previous levels—Hard Rain's thunderstorm, Dead Center's fuel grabbing finale, The Parish's sewer slog—but doesn't itself present anything quite as memorable. Your encounter with the original Left 4 Dead squad also feels strangely unsatisfying. Fortunately, the rock solid gameplay and new variations on what was already immensely enjoyable in Left 4 Dead 2 alleviates the comparatively ho-hum campaign. Anyone playing Left 4 Dead 2 on the PC needn't think twice about spending the bandwidth and time to download the free expansion pack through Steam. The new additions and the promise of even more variation in the game's rule set guarantee that The Passing will keep zombie slaying enthusiasts entertained week after week for months to come. The M60 machine gun, so satisfying to unload on a horde of infected, may alone be worth playing The Passing. For the Left 4 Dead 2 player spending 560 Microsoft Points ($7 USD), worry not about the complaints about the campaign's shortcomings, for its only be compared to the very impressive offerings included in the original release. Expect instead to enjoy its Versus mode on new maps and, through Mutations, to get the most out of your purchase. Also realize that you'll probably be sold on downloading the follow-up chapter coming to the original Left 4 Dead, if only to see how Bill, Francis, Zoey and Louis made their way so far down south and to learn what goes wrong along the way. Left 4 Dead 2 The Passing was developed and published by Valve for the Xbox 360 and PC on April 22. Retails for 560 Microsoft Points on Xbox 360, free on PC. A copy of the game was given to us by the publisher for reviewing purposes. Played through campaign multiple times on normal and advanced difficulty, played all game types, with the exception of Survival on The Passing exclusive maps.